Nestled in an historic Christian village in Northern Iraq’s mountains sit homes that once accommodated visitors intent on enjoying cooler temperatures and rugged scenery. The area was even a favourite of Saddam Hussein—the ruins of one of his castles top a local hill. Those quieter days are long gone now, ending even before the war that toppled the dictator in 2003. However, the rise of the Islamic State of Iraq and Syria (ISIS) has brought unexpected new visitors here. As ISIS violently entered the region, village residents welcomed fellow Iraqis fleeing the group’s terrors. Those once-abandoned tourist houses are today teeming with life. Iraqi children are taking a variety of classes at the Samaritan’s Purse Child-Friendly Learning Space in this mountain village. Along a gravel road just above those tourist homes where displaced families now find refuge, there are three small caravans and two tents.  These units make up the Samaritan’s Purse Child-Friendly Learning Space (CFLS) designed to teach first- through fourth-grade children (ages 6-12) who have undergone terrible trauma. With a student population of 142 split between morning and afternoon sessions, the children study Kurdish, Arabic, English, and math, as well as Bible stories, art, music, recreation, and a basic skills class. Class sizes range from 10 to 15 students compared to government school classes of 45 on average. 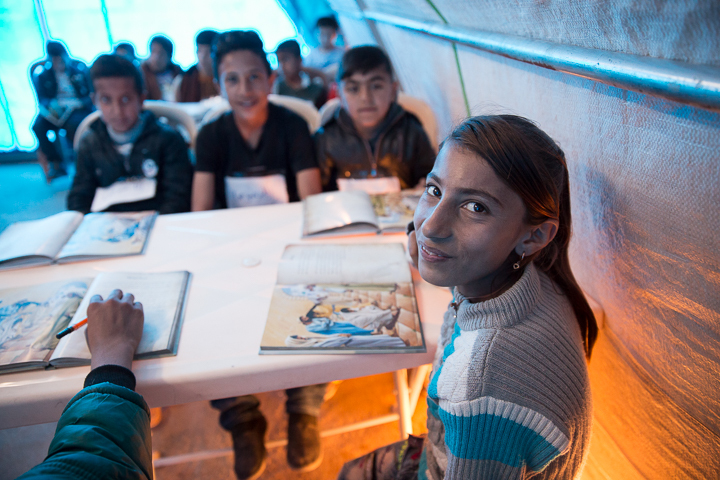 Inside one of the 10-by-16 foot caravans, a dozen 6- to 7-year-old students gather in a tight circle of small red and green plastic chairs for their Bible stories class. As their teacher reads the story, they follow along in their books complete with colour pictures. Then the students take turns retelling the story in their own words and the class claps after each student’s story. At the end of class, they all join hands to pray—their teacher leading and the students repeating after her in unison. A Bible story class is part of the curriculum at our Child-Friendly Learning Space in this mountain village. During the basic skills class, on the other hand, the students clean their desks and chairs and learn about picking up trash around their homes in the village. They also study hygiene. When there was a cholera outbreak in Iraq last autumn, teachers educated students on prevention. An eight-year-old boy named Akram said, “Everything in the school is very good. I like the music lessons.” Since studying with Samaritan’s Purse, Akram learned to play the tambur, a Turkish stringed instrument. 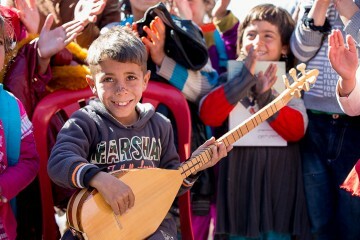 Music brings some joy into the lives of children who’ve fled ISIS terror. Noora, a 13-year-old girl, is happy to be studying because while many of the people in her family cannot read and write, now she can. “When the caravans came, it was like hope started for us,” she said. Our CFLS teachers receive training to help them understand the trauma the children have experienced and how to be sensitive to this as they teach. In September 2015, just five months after the school began, Samaritan’s Purse hosted its first graduation for 50 of the students who were leaving the school because of their age. During the ceremony, every age group in the school performed – from poetry to live art creation – that they had learned in their classes. The students also sang songs about their homeland as they celebrated with graduation hats and cake. They enjoyed adding good memories to so many of their bad ones about the flight from ISIS. 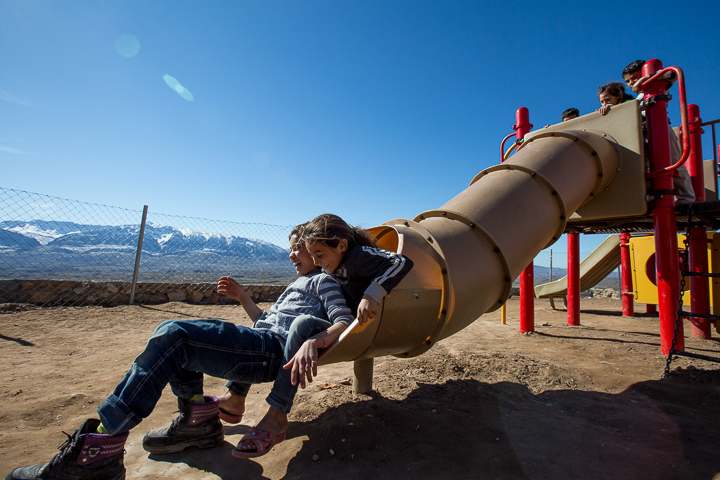 Displaced Iraqi children enjoy their new playground. Our Child-Friendly Learning Spaces allow kids to just have fun being kids. Samaritan’s Purse continues to extend hope to these Iraqis as the staff serve in Jesus’ Name. At the beginning of many of the classes, the children recite a poem in which they declare, “We are the sons of peace.” Despite the war they have experienced, this is possible as they encounter the Prince of Peace at this Child-Friendly Learning Space.